I just wanted to see how many Digimon with drills existed. Chaosdramon has a drill missile in Hacker's Memory, and I didn't add ALL the Shoutmons because that'd be crazy, so EX6 will have to do. 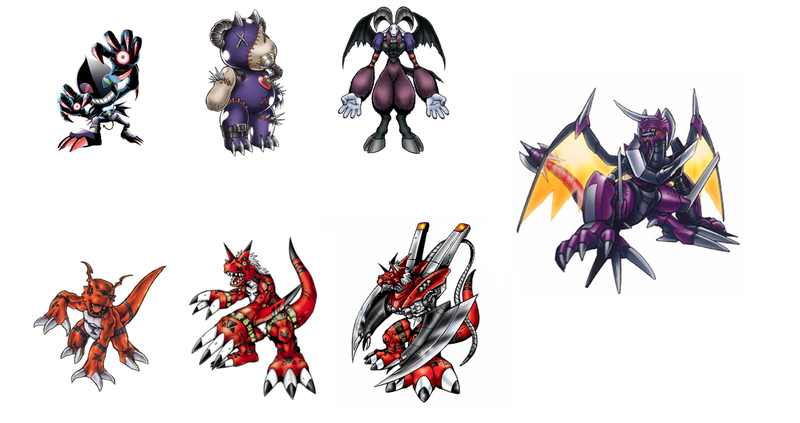 I don't play any mobile game but I can't wait to see Erismon's evolutions. Speaking of Erismon, his perfect has cowboy boots so it's the closest thing we'll have to a full cowboy line without using Appmon. Both lines are good: Tartaru's keeps with both themes of the first 3 line, even if garbagemon to holydramon isn't the most natural progression, tho, keeping with the motif of teeth and mono-colours is difficult (zanbamon in my yellow line was a big stretch). Actually, if you replace holydramon with bacchusmon it works a lot better, not only with the line in question but also with the "big mouths in need of a dentist" thing I was going for in the original splashmon line. Now I'm really mad at myself for not remembering bacchusmon existed. I'm having a hard time finding the OP but is someone making Power Rangers lines or somethin'? Idk, maybe I'll finish the ranger team if I have time, tho I might drop the teeth motif. please how does purple gun arrive to create a red version of the line for Leviamon ?? Last edited by rossi; 01-19-2019 at 05:49 AM. for some weird reason Neo Crimson had on of his Poison attacks dubbed as Fungus Crusher, so why not full mushroom line? You could use HerculesKabuterimon for the Mega, with NeoCrimson as a Ultra/Burst mode, since NeoCrimson also has Giga Blaster (dubbed as Giga Scissor Claw, which is an error and is supposed to be Mega Electro Shocker). But still, he has H-Kabu's attack. He also has "Double Edge", which WarGrowlmon has, but he didnt exist at the time. But I suppose you could still put him in there as the Ulitmate lol, since its a "shared attack". also, it seems Neo-Crimson just straight up has Mushroomon's attack, which is why it's dubbed as Mushroomon's dub name. Last edited by Muur; 01-20-2019 at 12:36 AM. MegaloGrowmon to Neo Crimson works very well, even though the shared attack is coincidental. It's not an error. Giga Blaster was always dubbed Giga Scissor Claw in the PlayStation games. This is kind of stupid but I really like Goddramon X Antibody as Monzaemon's ultimate because he's so fluffy. No child because everything can turn into Numemon (I used Geremon because the colours match though.) 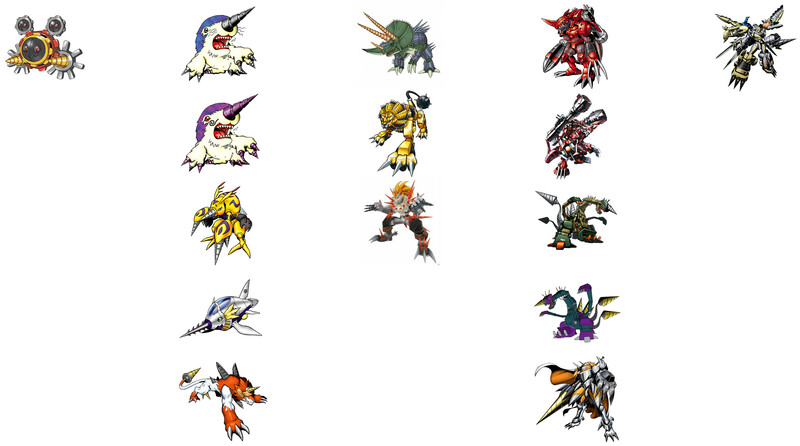 I'm still upset that so many lower level Digimon lost the X Antibody contest. lol. I was thinking too that he'd make a good ultimate for a male Renamon. He's got the shinto red and white thing on his shoulder like Kyuubimon. Always liked the idea of alternate gendered evolutions to Digimon. I had a similar concept for a male Renamon, with Raijinmon as their mega/ultimate.